Location: The region of the northwest of Middle-earth west of the Blue Mountains; destroyed at the end of the First Age. 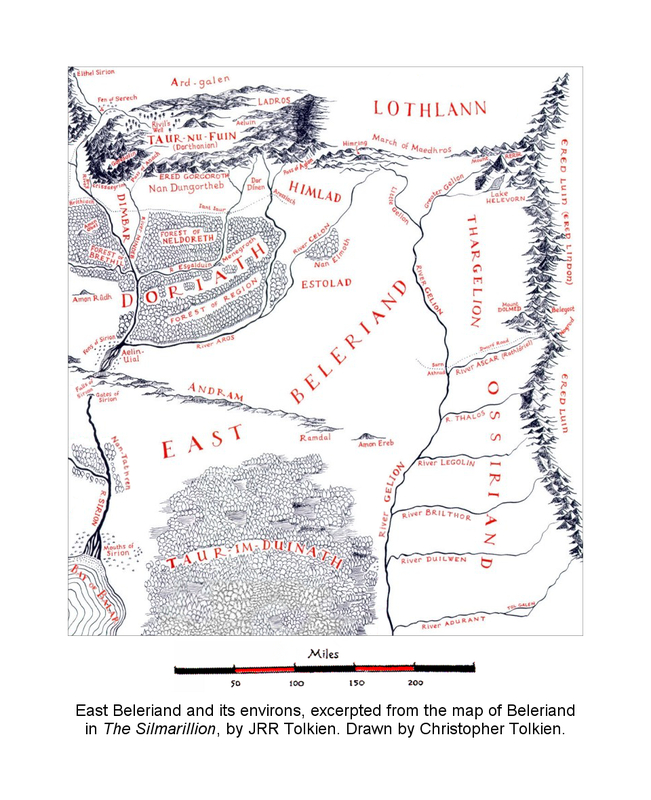 A color map of Beleriand. 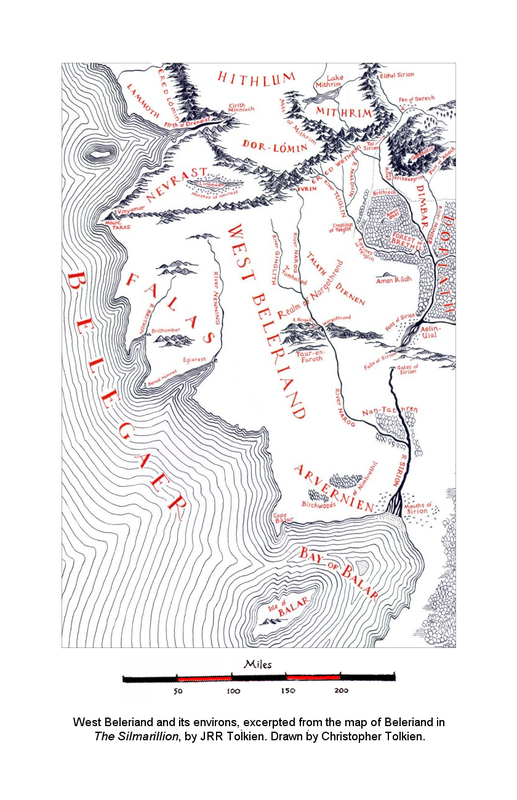 The name [Beleriand] was said to have signified 'the country of Balar', and to have been given at first to the lands about the mouths of Sirion that faced the Isle of Balar. 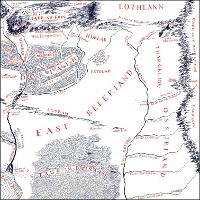 Later the name spread to include all the ancient coast of the Northwest of Middle-earth south of the Firth of Drengist, and all the inner lands south of Hithlum and eastwards to the feet of the Blue Mountains, divided by the river Sirion into East and West Beleriand. Now the great and fair country of Beleriand lay on either side of the mighty river Sirion, renowned in song, which rose at Eithel Sirion and skirted the edge of Ard-galen ere he plunged through the pass, becoming ever fuller with the streams of the mountains. Thence he flowed south for one hundred and thirty leagues, gathering the waters of many tributaries, until with a mighty flood he reached his many mouths and sandy delta in the Bay of Balar. West Beleriand, from Belegaer to the River Sirion. And following Sirion from north to south there lay upon the right hand in West Beleriand the Forest of Brethil between Sirion and Teiglin, and then the realm of Nargothrond, between Teiglin and Narog. And the River Narog rose in the falls of Ivrin in the southern face of Dor-lómin, and flowed some eighty leagues 1 ere he joined Sirion in Nan-tathren, the Land of Willows. South of Nan-tathren was a region of meads filled with many flowers, where few folk dwelt; and beyond lay the marshes and isles of reed about the mouths of Sirion, and the sands of his delta empty of all living things save birds of the sea. In the south-west of Doriath, where Aros flowed into Sirion, lay great pools and marshes on either side of the river, which halted there in his course and strayed in many channels. That region was named Aelin-uial, the Twilight Meres, for they were wrapped in mists, and the enchantment of Doriath lay over them. Now all the northern part of Beleriand sloped southward to this point and then for a while was plain, and the flood of Sirion was stayed. But south of Aelin-uial the land fell suddenly and steeply; and all the lower fields of Sirion were divided from the upper fields by this fall, which to one looking from the south northward appeared as an endless chain of hills running from Eglarest beyond Narog in the west to Amon Ereb in the east, within far sight of Gelion. Narog came through these hills in a deep gorge, and flowed over rapids that had no fall, and on its western bank the land rose into the great wooded highlands of Taur-en-Faroth. On the west side of this gorge, where the short and foaming stream Ringwil tumbled headlong into Narog from the High Faroth, Finrod established Nargothrond. But some twenty-five leagues east of the gorge of Nargothrond Sirion fell from the north in a mighty fall below the Meres, and then he plunged suddenly underground into great tunnels that the weight of his falling waters delved; and he issued again three leagues southward with great noise and smoke through rocky arches at the foot of the hills which were called the Gates of Sirion. This dividing fall was named Andram, the Long Wall, from Nargothrond to Ramdal, the Wall's End, in East Beleriand. 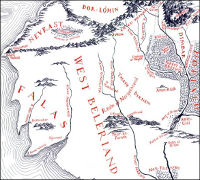 East Beleriand, from Sirion to the Blue Mountains. Upon the left hand of Sirion lay East Beleriand, at its widest a hundred leagues from Sirion to Gelion and the borders of Ossiriand; and first, between Sirion and Mindeb, lay the empty land of Dimbar under the peaks of the Crissaegrim, abode of eagles. Between Mindeb and the upper waters of Esgalduin lay the no-land of Nan Dungortheb; and that region was filled with fear, for upon its one side the power of Melian fenced the north march of Doriath, but upon the other side the sheer precipices of Ered Gorgoroth, Mountains of Terror, fell down from high Dorthonion. Thither... Ungoliant had... dwelt... and the thin waters that spilled from Ered Gorgoroth were defiled, and perilous to drink.... [The] Noldor would pass through Nan Dungortheb only at great need, by paths near to the borders of Doriath and furthest from the haunted hills.... [If] one fared upon [that way] he came eastwards to Esgalduin, where still there stood in the days of the Siege the stone bridge of Iant Iaur. Thence he passed through Dor Dínen, the Silent Land, and crossing the Arossiach (which signifies the Fords of Aros) came to the north marches of Beleriand, where dwelt the sons of Fëanor. Southward lay the guarded woods of Doriath, abode of Thingol the Hidden King, into whose realm none passed save by his will. Its northern and lesser part, the Forest of Neldoreth, was bounded east and south by the dark river Esgalduin, which bent westward in the midst of the land; and between Aros and Esgalduin lay the denser and greater woods of Region. Upon the southern bank of Esgalduin, where it turned westward towards Sirion, were the Caves of Menegroth; and all Doriath lay east of Sirion save for a narrow region of woodland between the meeting of Teiglin and Sirion and the Meres of Twilight. By the people of Doriath this wood was called Nivrim, the West March; great oak-trees grew there, and it also was encompassed within the Girdle of Melian, that so some portion of Sirion which she loved in reverence of Ulmo should be wholly under the power of Thingol. [In] the east [Andram] became ever less sheer, for the vale of Gelion sloped steadily southward, and Gelion had neither fall nor rapids throughout his course, but was ever swifter than was Sirion. Between Ramdal and Gelion there stood a single hill of great extent and gentle slopes, but seeming mightier than it was, for it stood alone; and that hill was named Amon Ereb.... But south of the Andram, between Sirion and Gelion, was a wild land of tangled forest in which no folk went, save here and there a few Dark Elves wandering; Taur-im-Duinath it was named, the Forest between the Rivers. In the fall of the Dark Power and the end of the First Age most of Beleriand was overwhelmed by the waters, or burned with fire. Beleriand was broken in the turmoils at the end of the First Age, and invaded by the Sea, so that only Ossiriand (Lindon) remained.